Our team of dedicated dental professionals in St. Catharine’s can help all family members with their dental care. From your 3 year old child’s first visit to the dentist to your elderly parents in need of comprehensive care, we strive to be accommodating and understanding of everyone’s dental needs. It is vitally important to us that we take the time to listen and care to all patients to provide the best and most appropriate dental care for them. We offer convenient extended hours from early morning and evening appointments to accommodate your busy schedule. 2017 marks Dr. Vlahos’ 25th year in dentistry. As a token of appreciation to his patients, he is offering at home teeth bleaching to ALL his patients. Contact Us. We Can't Wait to Meet You! Our office is proud to offer a wide variety of dental services to meet your needs. There are many ways to improve your smile. From simple and conservative tooth whitening to prosthetic solutions such as porcelain veneers and porcelain crowns. Invisalign treatment is a removable orthodontic treatment that can treat a variety of orthodontic issues quickly and esthetically. 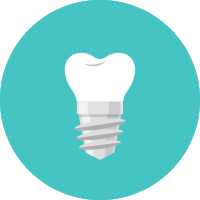 Dental implants are the gold standard for replacing missing teeth.